The new iPhone 5 is here. It's thinner and faster than ever, with a new form factor that uses a gorgeous panoramic screen with more resolutions and less consumption. It also surfs the web much faster, thanks to its new LTE capabilities. And, just as we knew, it has a new smaller dock connector called Lightning. Overall, it seems they have incrementally improved every single aspect of the iPhone. It's not a revolutionary phone, but it is a very nice release. The iPhone 5 looks exactly as the leaked images: an unibody aluminum body with a glass screen. "It's thinner than the previous generation: 18 percent thinner, which puts it at 0.29 inches (7.6 millimeter). They are claiming this is the world's thinnest smartphone. It's actually the world's thinnest LTE smartphone. It's also 20 percent lighter than the current iPhone, just 3.95 ounces (112 grams). It comes in black and white models. Their new manufacturing method seems quite extraordinary. According to Jon Ive, they "have never built a product with this extraordinary level of fit and finish." They claim that the "variances from product to product is now measured in microns." Apple claims that the new 16:9 4-inch panoramic screen has 44 percent more saturation than the iPhone, which makes the display full sRGB. The display has its touchscreen sensor built-in. How does it work? Instead of having two layers, the pixels of the display and the touch sensors, Apple affirms that here "the pixels do double duty—acting as touch-sensing electrodes while displaying the image at the same time." Apple says that no other phone in the market has this, which Apple says is crucial to the iPhone 5's thinness, lower weight and—more importantly—its image quality. Since there's nothing between the glass and the pixels, the say the image is much clearer than before. As expected, it uses LTE connectivity, so it will be much faster that the current iPhone 4S. It supports all the standards needed for all carriers: HSPA+, DC-HSDPA and LTE. Apple says that their single-chip solution works everywhere. The iPhone 5 also has dual-channel 5GHz Wi-Fi—aka 802.11N. That means a 150Mbps maximum connectivity speed. It also has a new CPU, the A6—which Apple claims is 2 times faster than the current iPhone 4S both in CPU and graphics. In real life, they claim it loads web pages 2.1 times as fast. If true, this is impressive: 8 hours of 3G talk time, 8 hours of LTE browsing, 10 hours of Wi-Fi browsing, 30 hours of video and 225 hours of standby. They have also updated the camera. On paper, it's better than the one in iPhone 4S with a new dynamic low light mode too (I wonder how it compares to Nokia's IOS) and a sapphire crystal. Knowing how scratched the glass on my iPhone is—making the photos not as crisp as when it was new—that's good news. Shapphire crystal is the hardest thing you can get this side of a diamond. Like the 4S, it has five-element optics and a 8 megapixel sensor (3264 x 2448 pixel), backside illumination, a hybrid infrared filter, and a nice f/2.4 aperture. The new image processing chip has spatial noise reduction, with a system to analyze which parts of the image needs to be noise reduced and which should be left alone. As a result of all this, they claim low light photography is now much better than before. Update: You can see other unprocessed images here. The image capture is also faster: 40 percent, they say. The iPhone 4S camera is now quite fast, so it will be interesting to see how this feels. Certainly, there's not such a thing as fast enough when it comes to taking photos. They have also added a new capture mode called panorama. It doesn't require you to stitch photos one by one: just pan the phone and it will automatically capture a panorama for you. Even if you can't hold it steady, iPhone 5 is smart, using its gyroscope to correct for any variation in motion and make a perfect panorama. It also gets rid of any moving objects, they say. The final result covers 240 degrees. Like the previous iPhone, this one has 1080p FullHD capture. They claim they have improved the image stabilization in this version, added face detection (so it will be able to tag people automatically in videos) and, this is good, it will allow you to take full still photos while recording video. They have also make the 720p front camera better with a new backside illuminated sensor. It also has face detection and—at last—the operating system will enable FaceTime over cellular. Apple has also upgraded all the audio: the microphones, the built-in speakers and the earbuds, now called EarPods. It now has three microphones—on the front, back and bottom. These will improve the quality of your voice calls—whoever calls anymore—and sound recordings. More importantly, they have include noise canceling without the need for external specialized headphones. Apple says that their technology cancels the noise from the place in which you are in, so you hear "the voice on the other end" more clearly. The speakers have much better quality now, going from three to five magnet transducers, which will result in a clearer, richer sound. Any improvement over the cricket boxes of previous versions is welcome. They have also improved the quality of voice calls. According to Phil Schiller, the new iPhone 5 can use something called wideband audio. If supported by the carrier, the phone will use more of the spectrum bandwidth to send much better and high-fidelity version of your voice over the network. As predicted, the dock connector has changed. It's now much smaller. Apple calls it Lightning (a name play of their other connector technology: Thunderbolt). It's all digital and has 8 connectors. It also has an adaptive interface, which I guess means that the connector will send different signals according to the kind of features you need in your connection. They best thing about the new connector, however, is that it is reversible. This may seem stupid, but being able to connect your cable no matter of the orientation will protect humanity against the 529th Article of Murphy's Law: "Thou will always try to connect your iPhone cable on the wrong side." Does that mean that you would have to trash your old dock accessory? No, they are giving us an adapter that will turn the old connector into the new Lightning. Phil Schiller says that they are working with peripheral manufacturers to include Lightning in their next batch of products, which will arrive this Holiday Season. They are keeping exactly the same prices as the previous generation. The iPhone 5 16GB is $199, the 32GB is $299 and the 64GB is $399, all with a two-year contract. In the United States, Canada, UK, France, Germany, Australia, Japan, Hong Kong and Singapore you will be able to pre-order it this Friday and get it the next, September 21 The other countries will have it on September 28. Oh, and if that's still too expensive for you: the iPhone 4S is now $99 with a two-year contract. 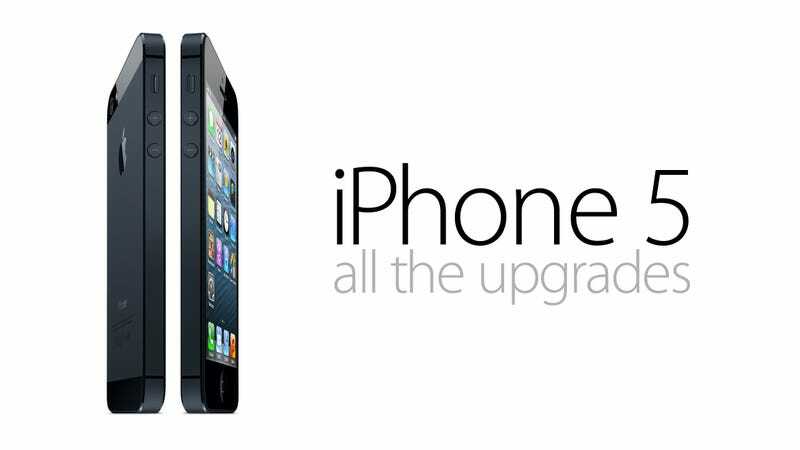 The iPhone 4 will be free with the same contract.